These are the instructions to root Google Nexus 7 (2012) WiFi running on android 5.1.1 using Chainfire Root Tool on Windows Computer. Remember: Your Google Nexus 7 should have at-least 30-40 percent of battery to perform the rooting process. If you are having Google Nexus 7 (2012) Mobile Variant then head over to this Page for correct root guidelines. Step 1: Download and install Google Nexus 7 USB driver on your computer. If Nexus 7 Tab USB drivers are already installed on your computer then skip this step. Step 2: Enable USB Debugging on your Nexus 7 Tab. To enable USB Debugging: Open Settings > Developers Option > USB Debugging > Tick to enable. Step 3: Now, Power off your Nexus 7 Tab. 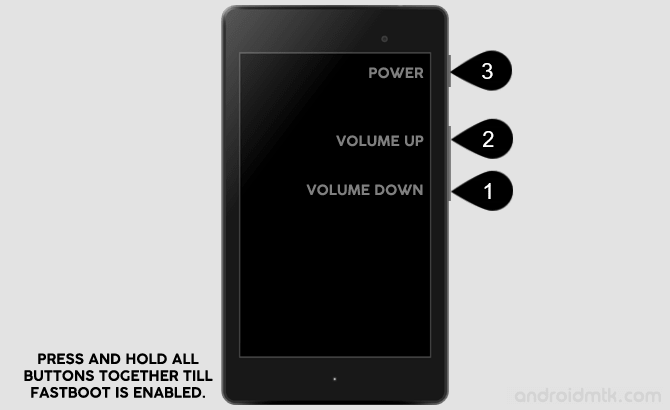 Step 4: Now, you have to enable Fastboot Mode on your Nexus 7 Tab while it is power-off. To enable FastBoot Mode: Press and Hold Volume Up, Volume Down and Power Button at same time until FastBoot Mode is enabled. Step 5: Connect your Nexus 7 Tab to the computer. Step 7: From the extracted file, Open root-windows.bat file. 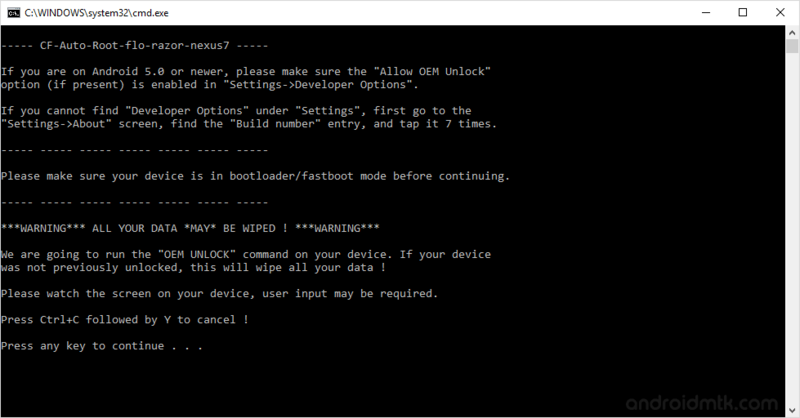 Step 10: Now you will be able to see Unlock Bootloader Screen on your Nexus 7 Tab. Select Yes using volume up/down button and power button to continue. Step 11: Now, on the next screen you will be able to see the FastBoot Screen with Disabled Lock State (at button) which means you have successfully unlocked the bootloader of Nexus 7 Tab. Step 12: Now, your Nexus 7 tab will automatically show red android logo and rooting process will continue. Once Rooting process is completed your Nexus 7 tab will restart automatically. Step 13: Your Nexus 7 Tab will take 2-3 minutes to restart. Once your Tab is restarted successfully, you will be able to see the welcome screen. Step 14: Now your Nexus 7 is rooted successfully. To confirm, Open App Drawer (menu) and you will be able to see a new Application installed called SuperSU. If you find this app then it means your device is rooted. Optional: You an also verify the Root Status of your Google Nexus 7 Tab using Root Checker Application. [*] Warranty Void: Your Google Nexus 7 Tab Warranty will be void after following the above tutorial. [*] Credits: The Google Nexus 7 Auto Root Tool was created by Chainfire, so full credits goes to him for the root tool.